Yeah the first 2 photo's look a bit yellow, it's a bad picture to be fair, what cricketers call "bad light". It's definately one of the lightest I've come across, and yes the colours are bright and look kind of soft when you see it in person. Best thing is it only cost me 3 quid, and the gun it came with is the translucent blue Stormtrooper blaster like the one shown on the main TIG page. Can't beat a bargain! is it orange paint marks on the rocket backpack? The prune face I got with the lighter legs is hanging outside day an night now. If it is fading, then the fading should continue and maybe the legs will turn out like that. Will see in sometime. [quote=Wbobafett] normally TW Fetts have much, much darker brown paint (belt, visor, etc.). 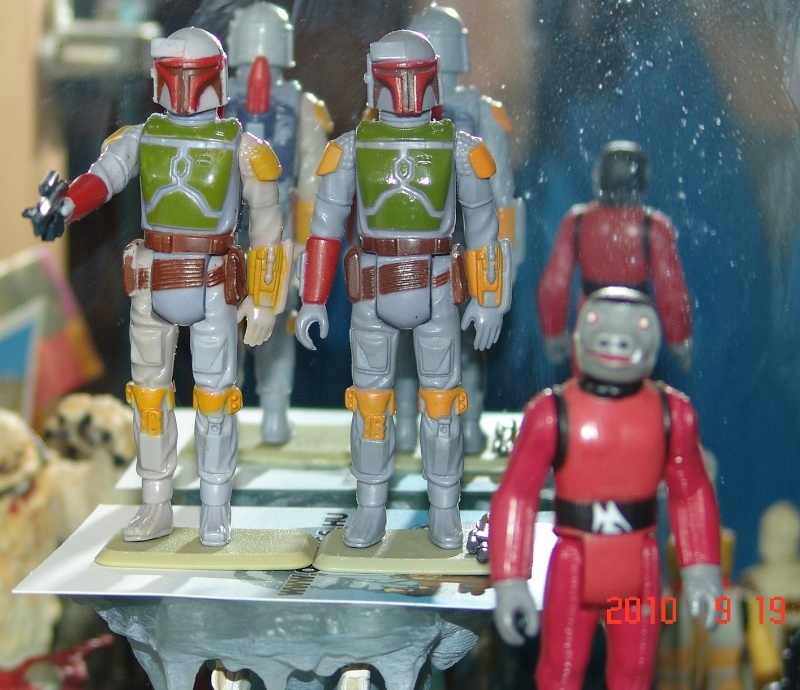 The HK Fett with nearly similar dark brown always has faded limbs...dont know why...but its a fact. Normal HK Fetts have much lighter brown paint apps. it does seem like other Fett's can fade too? Notice that this super light version is listed as a variant on the technical card (page 1 of this discussion). This off course is no guarantee that it isn't fading, but it would be interesting to know were they got their information. I'm going to have to check with motu, which is pretty much from the same years, if there is any fading there also transformers. Plastic is a pretty lasting material and I've read it can last up to a 1000years. This doesn't cover the color pigments ofc. I really wonder how many actually are fading and which are not. I got my doubts on many of the ones I have seen. I have around a 100 motu figures here and all I have seen on some of them are yellowing, gonna have to check if there is any info on fading on those. I've also noticed that it's only the hong kong boba which looks like this, and not the taiwan. I have seen one taiwan example though. If not looking at the almost white one, which looks like the plastic color itself and if it was not colored at all, then I think there should at least be a wide variety of fading, for example the trilogo ones, all I see got the same color. The prunefaces with bluish legs, also got the pretty much exact same colors. As for not needing sunlight, air can also trigger yellowing, but wonder how much air it is in those bubbles, maybe they can breath a bit through the cardbacks. Does look very much like the one in the Tech Cards, If I remember write, does it tell you on the SWCA site who did the Tech cards. It definately looks like it's actually the plastic colour, it's hard to imagine that the original blue plastic could ever end up that colour. Is it the exact same coo? It looks a bit like the H and O in Hong kong differ a bit, it's hard to see almost get blinded by looking close at it. Edit: When watching the large image I think that the H is lower on the blue one. Also maybe the C.
- Small copyright logo, and Hong Kong is higher with the 'G' nearer the knee line, writing is less prominent. - Large copyright logo, and Hong Kong is lower with the 'G' further from knee line, writing is more prominent. After you asked about the COO's Rawlin I had a very close look at mine, and it appears that there may be another! A kind of cross between the excisting two. - Small copyright logo, and the Hong Kong is printed Lower with the 'G' further from knee line. The printing of the Hong Kong does however look the same 'not quite a prominent' style as higher first version. As you can see, there is three different COO's, is it there for possible that the light limb version has it's own COO variation? Or does anyone out there have a standard Fett with 3rd COO? If so get it whacked up here! Great thread you started here, I've always classed the light limb Boba as a variation, mainly because my very light version which I've had from very early on in my collection could never have been a result of fading from the original blue, well at least not in my opinion. However there is no denying the fact that there are Boba Fett's out there with obvious fading to the limbs. Maybe it's not a question of "is it a variation or is it fading '" but actually a question of " which are variations, and which are faded "
Nice I doubt that any factory mistake could result in that coo. It's clearly visible on the C that it's not the same as the other ones. It might just be the picture but it looks like the coo on the blue are much stronger. Very interesting! I also think there are a few more differences like the number 1, but not sure if it's just the pic. How many here got this super light version? It would be very nice to know how many there are. Thats pretty much how I see it as well. I think some of you would benefit from this 2008 thread from RS - Variation, prototype or just discoloration? Luckily a lot of the images are still up even though the thread is pretty old. Yes I have seen that thread, but the thread don't really add anything to if light limbed boba is a variation or not. I find it hard to believe that all bobas faded. Also considering that the lighter trilogo is more accurate to the movie imo. Nice picture should be thousands of bobas just like that one if it's fading. Still all the "faded" limbs are the exact same color as the rest, except the super light. I would love to see some pictures of bobas in different grades of blue. And not just the bright blue and dark blue. Yes I have seen that thread, but the thread don't really add anything to if light limbed boba is a variation or not. I am going to ask a general question to variation hunters- What do YOU think makes a figure a variant? The reason I ask is that even if people show images of figures breaking down and turning funny colours it doesn't seem to be enough to convince people lol so I can only presume that the discussion is a little pointless. Either you think it is or you don't - there is enough evidence in this thread and the one I linked for people to make their own minds up but by this time it's impossible to have not decided one way or the other isn't it? Here are some discoloured Fett figures in Kenner bags. In picture B the figure is NOT discoloured in the blue text Made in Hong Kong bag instead its discoloured in the bag next to it- which is the ESB - B. The thing that connects both figures is just a plastic bag, which unfortunately is not the best place for a figure to be for 25+ years. What it may prove instead is that the plastics used to make those BAGS cause the discolouration, but that does not make it a real variation IMO. I meant no disrespect to you post it is a great thread, and I actually thought of rewriting it a bit, since it sounded kinda rude. What my point is that they are still the same color. And all bobas might have faded, sure but I would like to know if they really did, it's such a large amount of those that are considered faded if comparing to other figures. Also this as already said, this really large amount have the same color. This is pretty much the first boba I see that have both blue and light blue limbs. There should be many. With yellowing you can find pretty much any grade of it and pretty much none have yellowed the same way, where some have yellowed on just a spot and some are yellowed all over, and some have an even amount of yellowing, which I believe is the result of a reaction to air. Did you ever consider that it might not be faded but unfaded? maybe the leg just turned bluer just kidding. Could be but then there are faded on cardbacks. My main thing with variants/discolouration is this: Figures were supposed to be uniform colours (for the most part) which means that limbs and torsos were produced to look the same, unfortunately the torsos are usually made out of different plastics than the limbs because they have to be more solid. This is the reason that torsos do not discolour at the same rate as limbs and vice versa, you may have a blue limbed Fett with a green torso or a light blue limbed Fett with a normal blue torso.. if the entire figure was the same colour then the argument that this is a production variant would hold water. Trilogo Fett VS discoloured Fett. The light grey Trilogo Fett was produced with a light grey torso and light grey limbs, again due to the plastics which are different on the figure, the torso can over time become darker (especially on the back) but a mint condition one is completely grey. 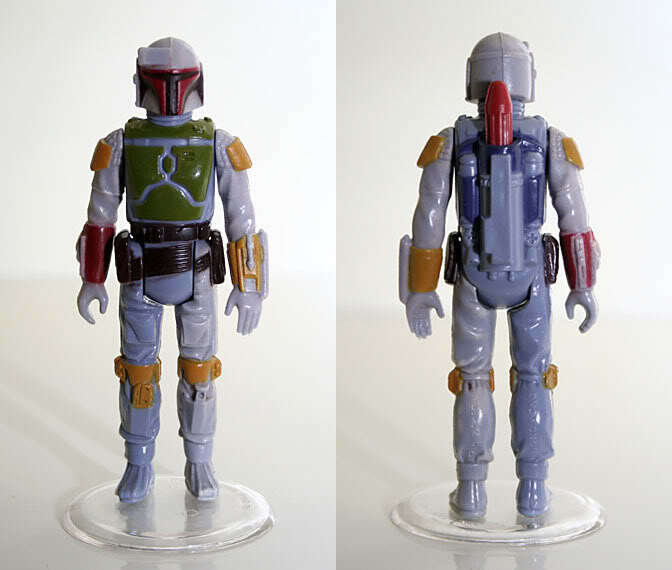 The discoloured Fett in this thread, if it was a variation would have been produced with a light grey torso that matches the limbs, however none exist. Either the torso goes green on a normal fett or the limbs go lighter, but the entire figure does not look the same. I don't know how to break it down any clearer than that. I know I can come across as standoffish with these discolouration threads and it's not my intention. I just think that when you take into account how the figures were meant to look like when produced and the amount of things that can damage/change a figure over time you can put these "variations" into perspective. Kenner were a strict company with quality control, the odd error slips out but figures with light limbs and dark torsos that were meant to look the same colour did not leave the factory like that. Sorry guys. Well to expand on that, it might not even be that plastic that the bags/bubbles are made of, in fact its more likely to be the fact that the gasses that the figures produce over time have nowhere to go. A sealed bubble effectively is the same as a sealed bag - it's a prison that these gasses can not escape from. You know the smell when you open your collection cabinet? That very strong plastic smell? Well that is all going on in baggies + bubbles the world over with nowhere to go. Unfortunately the figures will all destroy themselves at some point, they were not meant to last forever - good storage conditions will elongate their life and they may outlive all of us but they will not last forever. Hmm my cabinet is very well ventilated so I have never smelled something like that, I never had the opportunity to open a sealed one. My own trilogo boba since I was a kid was the light blue, I sold it some years back. Childhood memories ain't the best but I was actually surprised when I got another boba and it was not light blue. What I remember it was never dark blue. But it's a childhood memory and nothing to go on. The gases are a theory but, mine was opened since I was a kid, getting a figure was pretty much the best thing in the world to me when little, I just ripped those up as fast as possible. I remembered a good thread at transformers forum about yellowing, but it was removed when they updated the site, luckily they archived it. I hope the link works and the kind members dug it up for me. Yes I have read this thread and many like it several times over the last few years, surprise surprise Mr Grumpy here doesn't agree with the practice. Been doing this for a pretty long time, though never sell anything that are not clearly described for what they are. Doesn't work well on sw figures. But it wasn't the removing of yellowing I linked it for, more for the very many pictures of yellowed transformers, showing what colors they may take when yellowed. Btw, just a thought about this figure. How come one leg did not fade in this case. What I know they made all the legs and arms in same mold. So it should have been affected as well. Unless it's a left over leg. I might be wrong, but isn't afa's acrylic boxes made with a small opening for air? Edit: Just for fun. Spare leg or coo1? Hey Joe, just noticed the Fett in you picture looks very similar to the super light limb in my collection, I'm definately warming to the idea! I've noticed alot of people on Ebay recently selling Bespin Luke's with "translucent" heads, I've had one in my collection for a while, mainly because I have a Bespin Luke focus and I have been doing alot of research on him, so I try and have a look at every angle. However there has never been any doubt in my mind that it has been a result of fading, made more obvious by the fact that every single one I have seen has faded limbs to match the "translucent" head. They all seem to have the 2 leg Hong Kong COO stamp, which I definately know was available in a baggie. I gave that thread a good read as well, very interesting, thanks Joe. other two limbs: faded, I agree with the Degradation Party on those two. I could demonstrate the faded and the grey limbs "type" on ONE specimen! Great, isn't it? So please let's NOT overdo "colour variants madness", OK, BUT let's NOT overdo the other extreme, the "degradation, fading madness" either. I hope not to hurt anybody's feelings, but really: IF there is a Fett figure with NOTHING faded on it, but it has light yellow paint on the knee and shoulder plates, that can only mean one thing: a LIGHTER paint was applied. If a figure fades, both the paintjob and the plastic fades... One cannot go without the other. But I am a Newbie here, so I might be all wrong... Still, I had to say my opinion. I see what your saying on the colors, but eventually, they will got to white or grey in the end. Any color chart will show how the colors change. 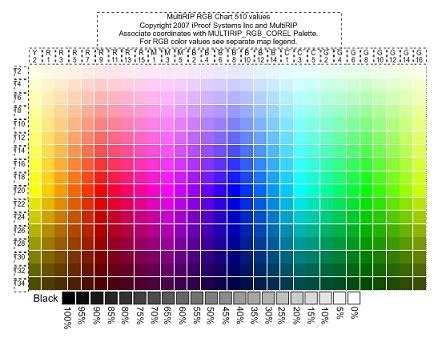 So sometime down the line, the blue will go light blue, then grey according to this chart. And the yellow paint on the knees will also fade to a lighter color along with it. Shouldve found this yesterday. As you can see on the black chart, the grey will also fade to tan also , for other figures as the colors fade and deteriate. And since the limbs are made of softer plastic compared to the torsos, they will fade faster than the torsos will. How do you know that, Joe? Did you have a relative working there? We all know they were intended to have the same or very similar colours on the body and limbs of a given figure. So grey limbs (Fett) and tan limbs (Klaatu) may be wrong, against common sense and against quality control, BUT I tend to accept the 'use of spare limbs' idea. We can probably never convince each other, but hey, even the Light Side and the Dark Side can co-exist!